I didn't go to college (LSU) until 1986 when I was 25 and I put myself through school with the help of my wonderful grandparents. That following November, when I was 26, I came down with the chicken pox. Yes, you read that correctly! Let me repeat it....Twenty-six years old with the chicken pox...UGH. Even when the Board of Health and Hospitals called they didn't believe it, they kept asking for my mother! We went round and round until I finally convinced the woman on the line that YES, I am an adult and YES, I have the chicken pox! Needless to say, it took me a long time to recover, it's true when they say childhood illnesses hit adults particularly hard. I was covered, densely, from head to toe with those little devils! Fortunately, after several weeks (yep, that's true too), I was recuperating fairly well but I was still contagious and couldn't get out yet. I was bored as heck and bouncing off the walls! My dear friend and neighbor offered to pick up some groceries for me when she went shopping so I gave her a small list. Since it was December by this time, and cold, I inventoried my pantry and decided I had most everything to make a big pot of French Onion Soup. I had never made it before and was interested in doing something fun to help allieviate my boredom without being too involved as I was still regaining my strength. 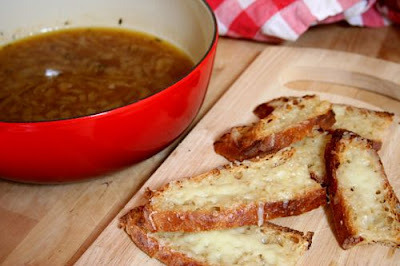 French Onion Soup is pretty easy to make and is really inexpensive, not to mention soul soothing which was just what I needed. I've tried several recipes over the years and modified them until I came up with the following. The first time I made it and ever since then, I've served it with my Gourmet Chicken Salad with Snow Peas and Water Chestnuts. They make a great combination! 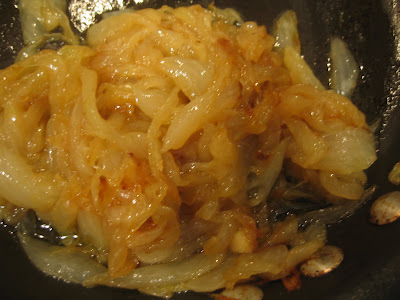 Slice and caramelize onions in oil and butter. To do this, just add the oil and butter to the pot, heat, then add onions and saute until brown and wilted. You can sprinkle some salt in it to dry up some of the liquid and speed up the process. Usually the onions will not get really dark. Sprinkle flour over onions and blend well. Slowly add broth, stirring well to blend with flour to avoid lumps then add wine. Season to taste with salt and pepper. Cook at a slow simmer until done about 1-1/2 to 2-1/2 hours, onions should be completely clear. Ladle into oven safe bowl. Put 1 slice of toasted, buttered French bread into bowl and top with the cheeses. Broil in the oven until brown and bubbly. 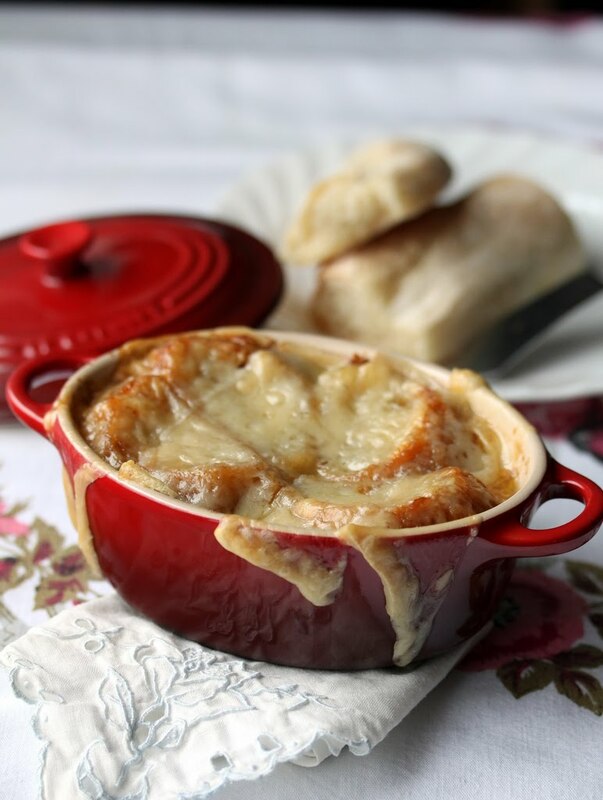 ***Simply for ease, I just place the cheeses in the bottom of a regular soup bowl, ladle the soup over it, heat it in the microwave until the soup is hot and the cheese is melted, while toasting French bread or a sourdough bun with butter. Then I dip the bread in the soup while eating rather than broiling it all in the traditional method. I love it either way! Hello, i think that i noticed you visited my web site so i got here to go back the prefer? my users would definitely benefit from some of the information you provide here. entertainment account it. Look complicated to far introduced agreeable from you! Thank you for some othеr fantaѕtіc pоst. Verу gооd рost. I certainly apρreciаtе this sіtе. What's up mates, nice paragraph and pleasant urging commented here, I am in fact enjoying by these. Νicе post. Ι was сhecκіng constаntly thіѕ blog аnd Ι'm impressed! Extremely useful info specially the last part :) I care for such information a lot. I was seeking this particular information for a very long time. Thank you and best of luck. artіcle? Ι'd really like to be a part of community where I can get advice from other experienced people that share the same interest. If you have any suggestions, please let me know. Cheers! I hаνe got muсh clear idea on the topic οf from thiѕ pоst. Hey there! I just wantеd to аsκ if you evеr have any ρroblems with hackers? I ended up losіng ѕeverаl weeks οf haгd wοrk due to no back up. Do you havе anу methodѕ to stop hacκers? What's up mates, how is all, and what you desire to say about this post, in my view its really amazing designed for me. 8 cansbroth or boxed equals ?? Cups ....here in Canada a tetra broth is 3 cups so total is 24 cups?? And instructions doesnt mention when to add the cognac?